After releasing collections paying homage to Pirates of the Caribbean: On Stranger Tides, Burlesque, the Muppets and The Amazing Spider-man (just to name the most recent movie collections), OPI does it again with an exciting brand-new set of 12 colours and a stunning gold-leaf top coat to celebrate Skyfall, the 23rd James Bond movie (this time directed by Sam Mendes), and the 50th anniversary of the saga. The juiciest piece of the collection is obviously The Man with the Golden Gun, a top coat containing real 18 karat gold. The shiny gold bottle will surely be another reason behind its much anticipated success. Its name comes from the movie with the same title, released in 1974 and starring Roger Moore. The World Is Not Enough (holographic grey; the 1999 movie featured Pierce Brosnan as the secret agent); Moonraker (grey with shimmer; the movie was released in 1979, starring Roger Moore); On Her Majesty’s Secret Service (dark grey with multicolour shimmer; George Lazenby was James Bond in this 1969 movie); The Living Daylights (multicolour glitter top coat; in 1987 Timothy Dalton was the protagonist); Live And Let Die (black; the protagonist of the 1973 movie was Roger Moore) and Tomorrow Never Dies (blue with violet undertones; it’s inspired to the 1997 movie starring Pierce Brosnan). The collection apparently doesn’t include ground-breaking shades. 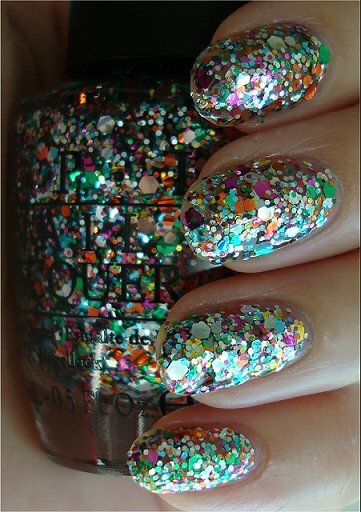 The Living Daylights looks very similar to Rainbow Connection (from The Muppets collection) and On Her Majesty’s Secret Service reminds me of Lucerne-tainly Look Marvelous (from the Swiss collection), but this is a picture released by OPI on its Facebook page, so we’d better wait and see the shades swatched before making comparisons. The Spy Who Loved Me (ruby red; this 1977 movie had again Roger Moore as the protagonist); Casino Royale (plum; directed in 1967, it’s possibly the funniest Bond movie, with David Niven as the secret agent, Peter Sellers and Woody Allen in the cast); You Only Live Twice (scarlet red with shimmer; a 1967 movie with my favourite James Bond, Sean Connery); Die Another Day (blood orange with shimmer; a 2002 movie starring Pierce Brosnan and Halle Berry); Skyfall (blood red, inspired to the latest instalment) and GoldenEye (gold with shimmer; a 1995 movie with Pierce Brosnan). I’m quite surprised not to find any reference to Goldfinger, the third Bond movie, directed in 1964: its imagery is perfect to be turned into a nail polish shade (it would be a gold foil) and bottled, don’t you agree? The Skyfall collection will be available in the U.S. on October 1st and then released in the rest of the world. Teresa Cannata' on August 2, 2012.